1. 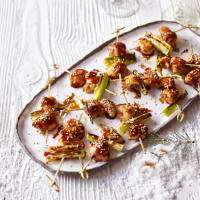 Thread the chicken and leek alternately onto 18-20 short bamboo skewers (or snip longer ones in half). You should have 2 cubes of chicken and 1 piece of leek on each. Brush lightly with oil and arrange on a foil-lined grill pan. 2. Preheat the grill to medium. Cook the skewers for 7-8 minutes on each side until nicely browned and completely cooked through with no pink meat. Drain off any excess liquid. 3. Meanwhile, for the yakitori sauce, place the mirin, soy sauce, vinegar, sugar, cornflour and ginger in a small pan. Cook gently, stirring for 2-3 minutes, until bubbling and thickened. 4. Brush the chicken with the yakitori sauce and sprinkle over the sesame seeds. Return to the grill for a further 1-2 minutes until the seeds are toasted. Transfer to a platter and serve warm. The mirin in this recipe can be swapped for a medium sherry such as Waitrose Medium Dry Amontillado. This recipe was first published in Wed Nov 16 09:34:07 GMT 2016.